This January, the UK PORCELANOSA Group has organised an outstanding promotion. 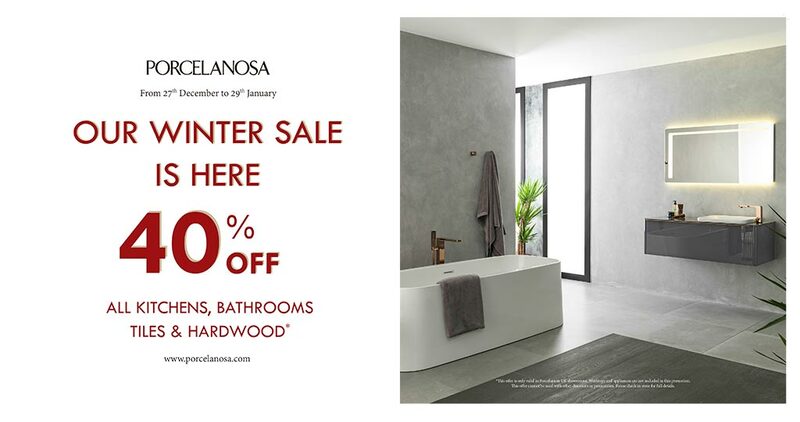 From December 27th until February 5th, enjoy 40% discount on kitchens, bathrooms, ceramic tiles and wooden materials, so you can renovate your home with PORCELANOSA Group’s top quality and cutting-edge designs. From December 27th to February 5th visit any PORCELANOSA Group showroom in the UK and don’t miss this one-time opportunity to turn your architectural and interior design projects into reality. * This offer is only valid in Porcelanosa UK showrooms and authorised retailers. Worktops and appliances are not included in this promotion. This offer cannot be used with any other discounts or promotions. Please check in store for full details. I have bought a house that is 10 years old & the bathroom has brown porcelanosa tiles . One needs replacing . Do you have any dark brown tiles ?